Have you heard of Saturated Canary? Well, Krista is just so sweet and she has wonderful digital images. Her little characters have so much life! I used a punch to cut some patterned paper squares and "quilted" my background. Then I colored and matted my image. 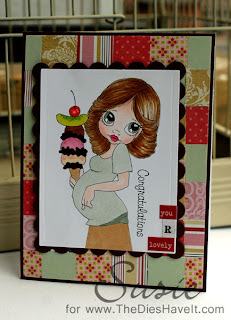 To finish my card I stamped Congratulations and then added a few word stickers. I hope you like today's card and I hope you will check out Saturated Canary too. Another darling card! Love the ice cream topping!